ZOLL R Series ALS Defibrillator the first R Series and the most advanced and sophisticated ALS defibrillator available with networking capabilities and See-Thru CPR. ZOLL Medical's Code-Ready defibrillator, the R Series, introduced Simple, Smart, and Ready defibrillation to hospitals. Two new models now make code-readiness possible for every hospital department with advanced, cost-effective solutions for resuscitation. The worst time to find out a defibrillator isn't ready is at the code. Delays and confusion caused by multiple cables, expired or dried out electrodes, and complicated controls are just a few of the things that can compromise code readiness. And, any defibrillator that doesn't support CPR compromises your ability to resuscitate. No simple self-test will alert you to these things until it's too late. You need a Code-Ready defibrillator a defibrillator designed to provide clinicians with comprehensive support for resuscitation. Now, for the first time you have one: R Series. OneStep simplicity creates a new level of rapid, easy deployment. OneStep Cable with OneStep Cable Manager The R Series features a single cable capable of monitoring, pacing and defibrillating, which reduces confusion and clutter and ensures you are ready for whatever needs to be delivered. And cable storage is as simple as it gets the cable gets wrapped and put in the caddy pre-connected to the electrode. When you need it, pull and go! No pouches, no tangles no confusion, just simple intelligent design. OneStep Resuscitation Electrode The R Series OneStep Resuscitation Electrode allows you to monitor, defibrillate, cardiovert, and pace. You can now pace your patient without attaching a separate three-lead cable. What this means to you is one less step, and one less chance for error. For your patient, it means quicker delivery of therapy. ZOLL is the first and only company to offer a true one-step process. The electrode cassette attached directly to the side of the R Series is another way that defines Simple. There is no dangling of pads or cables to worry about. When it's time to deploy, simply tear away the tab to reveal the pads. The electrode is pre-connected to the therapy cable and ready to deploy. On-Board Storage Electrode packaging insures electrodes are installed and ready for use. CodeReady Connector Electrodes are pre-connected without opening so the shelf life is never compromised. No need to disconnect for testing. Peel, lift, and place, eliminates tangles and speeds application. Condition Sensor Electrodes are regularly monitored. Defibrillator advises anytime therapy will be compromised by electrode condition. Expiration Alert The defibrillator automatically issues an alert when the electrode approaches expiration date. OneStep Pacing Integrated ECG electrodes in the anterior defibrillator electrode eliminate the need for a separate ECG cable. Real CPR Help Enabling Real CPR Help is as simple as placing the electrodes. 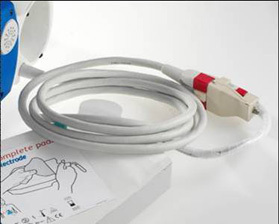 R Series has a new set of electrodes - OneStep Complete - a single electrode set that provides defibrillation and pacing, without the need for separate ECG leads, and CPR support. And, the electrode will sense a pediatric patient and adjust the current delivery accordingly. That's simple. ZOLL's patented pacing technology remains the gold standard: ZOLL was established on external transcutaneous pacing, and that is still true today. The ZOLL waveform has the highest rate of capture with the lowest current required. See-Thru CPR See-Thru CPRTM allows a rescuer to view the patient's underlying ECG rhythm while performing CPR. Both the R Series and E Series filters the rhythm through CPR motion when using a CPR Connector and CPR Stat Padz (or CPR-D Padz) attached (and OneStep electrodes for the R Series). When CPR begins, the R Series and E Series automatically starts filtering CPR artifact after detecting the first 3 to 6 compressions. The filtered ECG labeled, FILT ECG may be displayed on the screen via a second waveform by pressing the Wave 2 soft key below the screen. See-Thru CPR filtering continues as long as the CPR Stat Padz (or CPR-D Padz) detect compressions, patient impedance is valid and the device is not in diagnostic monitoring mode (12-lead ECG). When no compressions are detected, See-Thru CPR filtering stops, unfiltered ECG signals are displayed and the unit changes the label on the second waveform to ECG. CPR performance feedback via Real CPR Help and See-Thru CPR technologies are easily accomplished with quick and easy to apply CPR Stat Padz (or CPR-D Padz). Because the CPR monitoring functionality is built directly in to the pads, there is no compromise to code readiness or your ability to quickly apply the pads to the patient before the monitor displays CPR performance data. Data Transmission All our product lines have the ability to capture event data and optional capability to transmit CPR data, offering the ability for complete resuscitation review and playback. Real CPR Help The R Series provides complete support for CPR, because at a code, CPR is not optional. CPR feedback is easy and automatic with the OneStep electrode no separate pieces or cables to plug in. The CPR Index provides a quick visual indication of compression quality. See Thru CPR TM reduces interruptions. Most importantly, the CPR feedback in R Series can be tailored to staff needs; it prompts only when something is wrong, so there is no extra noise and confusion to add to a chaotic situation. The goal of CPR feedback is to help clinicians with the three most important elements of CPR: Quality of depth and rate, minimizing interruptions, and understanding that even good quality compressions take time to generate adequate blood flow. The CPR Index is a unique visual indicator of CPR effectiveness. Good quality compressions are easily represented in a single visual index that integrates depth and rate at the same time. The CPR Index takes about 20-25 good quality compressions to become completely full, but empties rapidly when compressions fall below target zones. SurePower System provides unprecedented cost-effective defibrillator battery management. Clinicians need to be sure batteries that power life-saving defibrillator equipment will work when needed. Defibrillator batteries are often replaced unnecessarily to ensure dependable performance, often because of the difficulty of insuring the battery's condition. The ZOLL SurePower System brings clinicians the confidence that batteries will meet user demands and removes the uncertainty that drives costly maintenance practices. At just 1.7 pounds, the SurePower Battery Pack has four times the energy density of traditional battery chemistries. Its lithium ion chemistry keeps pace with the growing demands of today's defibrillators. The SurePower Charger Station is the cornerstone of this innovative maintenance system. With the simple exchange of SurePower Batteries in and out of the charger, calibration is automated and history of use is recorded. Icon-driven interface reports state of batteries. Charges full range of ZOLL defibrillator batteries: SurePower, 4410, 4410 Smart, 4410 SmartReady, and XL batteries. Designed to accommodate future chemistry variants. Interfaces with PCs running SurePower Manager Software. SurePower Manager Software provides effective battery management by delivering unparallel access to information that helps you understand your organization's defibrillator-battery demands. SurePower Managers helps you eliminate premature battery disposals in light use areas, while ensuring sufficient runtimes for more demanding applications. SurePower Manager helps track the status of your entire fleet, and provide a concise picture of future battery needs and replacements. Smart tools for training include a Defib Mentor built right into the R Series that allows for a quick tutorial to maintain familiarity. Problems during a code are often related to inadequate tests, compromised supplies, batteries, and missed shift checks. The R Series extends testing far beyond a basic test shock to check more than 40 individual indicators of readiness. That's Code-Ready. Comprehensive testing automatically confirms the presence of the correct cables and electrodes, senses the type of electrode, and checks important circuitry, including discharge. There is no need to disconnect the electrodes or paddles, or get additional test equipment to test shock delivery. The system will even detect missing or dried-out electrodes and provide a printed or electronic log.